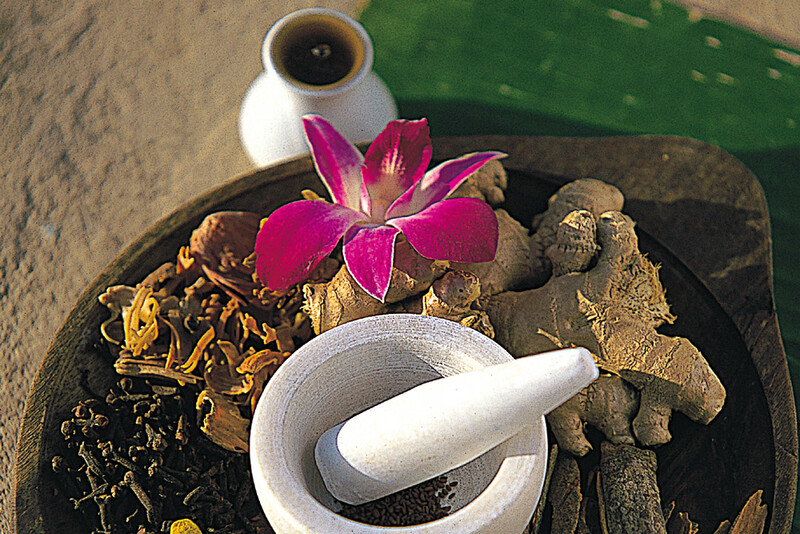 This tour unravels the history, tradition and culture behind the “house specialities”. Mughulai cuisine is rich, creamy, deliciously spiced and liberally sprinkled with nuts and saffron. The ever popular Tandoori cooking (chicken, meat or fish marinated in herbs and baked in a clay oven) and kebabs are also northern cuisine. In the south, curries are mainly vegetable and inclined to be more hot. Coconut is a major ingredient of South Indian cooking. The Punjabi tandoori cooking is celebrated as one of the most popular cuisines throughout the world. Huge earthen ovens are half buried in the ground and heated with a coal fire lit below it. Marinated meat, chicken, fish, paneer, rotis and naans of many types are cooked in this novel oven and the results are absolutely scrumptious! The Moghulai cuisine is literally ‘fit for royalty’ with it’s rich sauces, butter-based curries, ginger flavoured roast meats, and mind-blowing sweets. 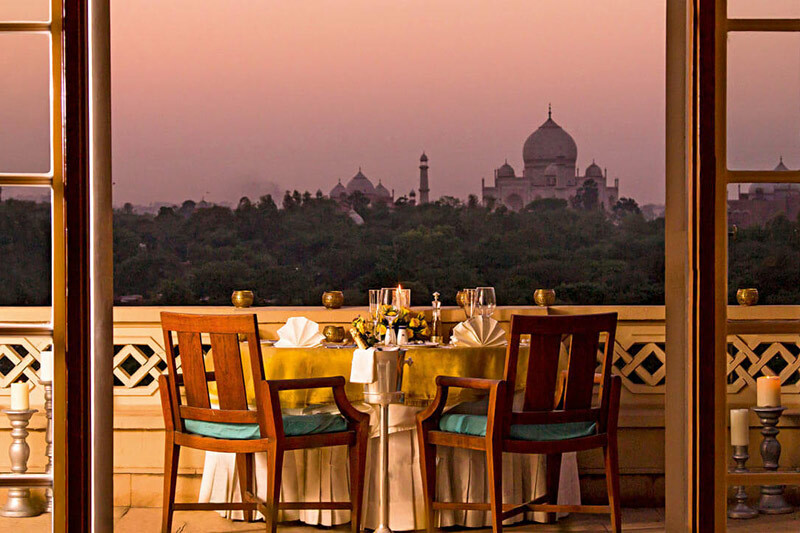 Although available throughout the country, the best place to try this royal cuisine is in Delhi. Rajasthani cooking was influenced by both the war-like lifestyles of its inhabitants and the availability of ingredients in the desert region. Food that could last for several days and could be eaten without heating was preferred, more out of necessity than choice. 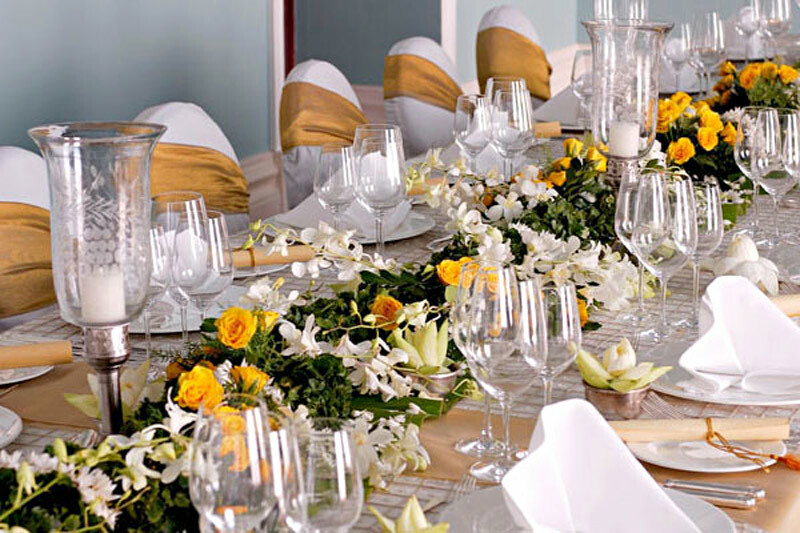 Princely feasts flaunt meat delicacies that are incomparable. In contrast are the vegetarian Rajasthanis who cook their food in pure ghee. 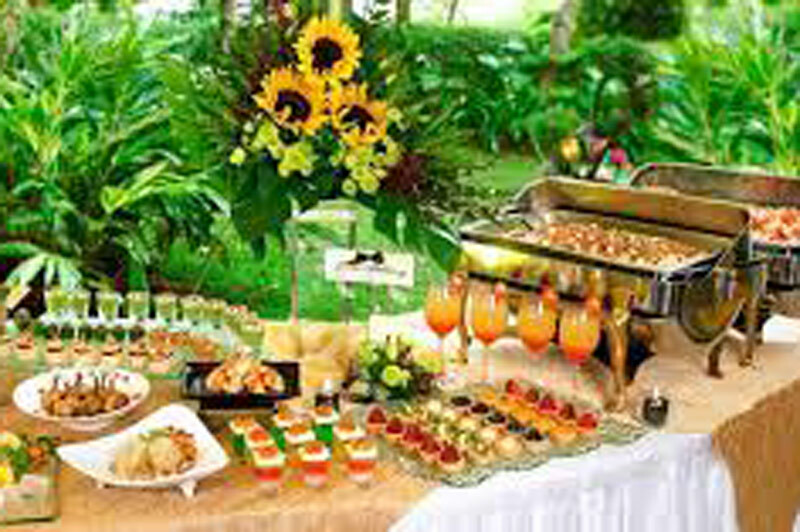 Besides a splendid choice of sweets and sweetmeats, there is an abundance of fruit, both tropical – mangoes, pomegranates and melons – and temperate apricots, apples and strawberries. The variety of Indian cooking is immense, it is colourful and aromatic, it can be fiery or not as desired and it is inexpensive even at the top class hotels. No wonder, then that it is now the third most popular cuisine in the world! An aromatic day-out choosing spices, nuts and local pickles from the markets of Old Delhi. Introduction to one of the oldest and largest distributors of saffron, the most expensive spice in the world! Visit traditional food stalls and experience the street food culture of Old Delhi ending with lunch. 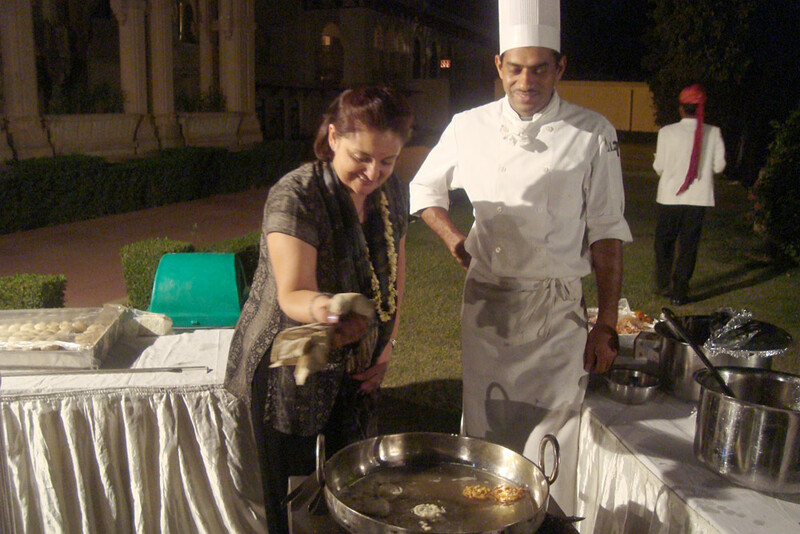 Indulge in an “Awadhi cuisine” cooking class conducted by the head chef of a leading hotel. 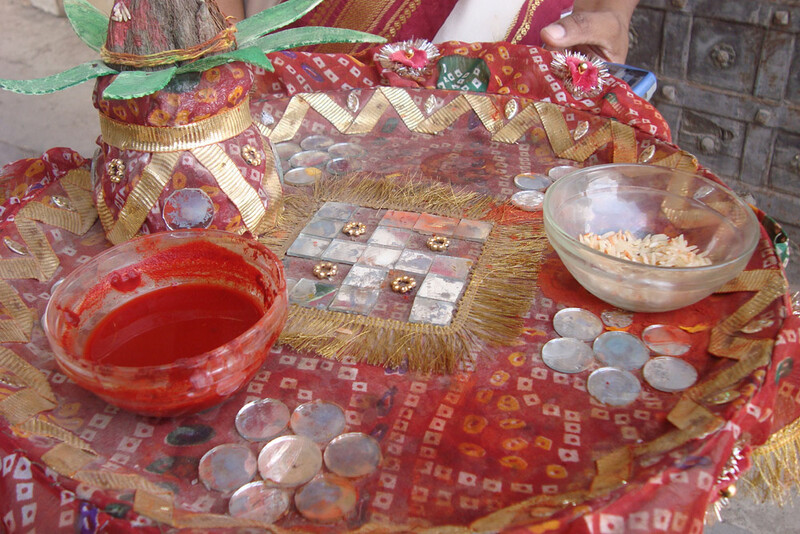 Partake in traditional Indian meals, using the thali (plate) or banana leaf decorated with rangoli (a design drawn with white and colored powders). Horse and carriage ride in the town of Lucknow. Sunset visit to the famous Taj Mahal in Agra. 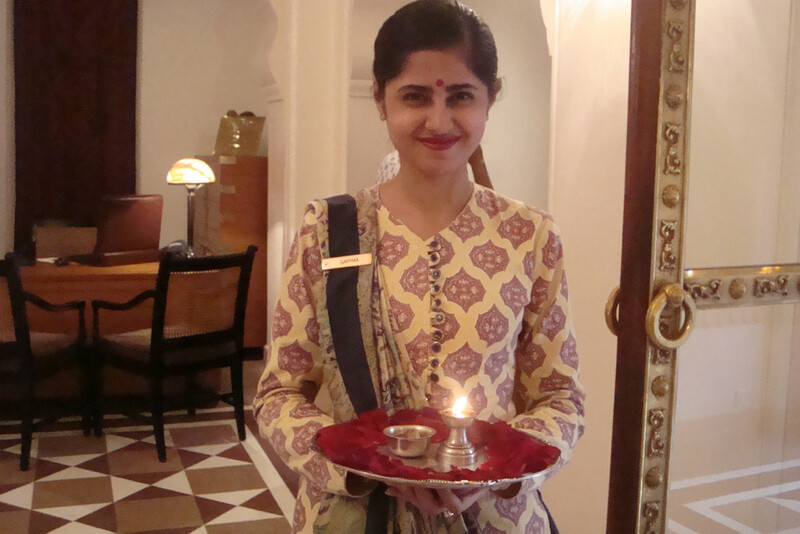 Try out the “Sari” – the traditional Indian female dress and be presented with a beautiful embroidered sari. A cooking demonstration and lunch in Devra. Boat cruise on Lake Pichola. Morning tour of Old Delhi. Cooking class with dinner at a private house. Overnight at your hotel in Delhi. Transfer to airport for flight to Lucknow at 08.05 a.m. Arrival Lucknow at 09.00 a.m. and transfer to hotel. Cooking demonstration with the head chef of the hotel followed by lunch. City tour of Nawabi Lucknow including a Tonga (horse carriage) ride. Overnight at your hotel in Lucknow. Morning sightseeing tour of Lucknow. Departure transfer to train station. 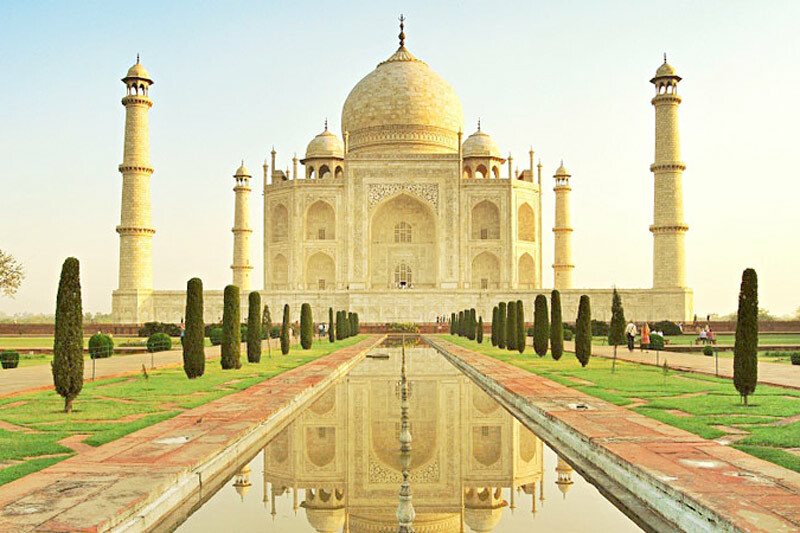 Afternoon enjoy city tour of Agra including sunset visit to Taj Mahal. Drive to Jaipur, en-route visit Fatehpur Sikri. Lunch at Laxmi Vilas Palace Hotel in Bharatpur. 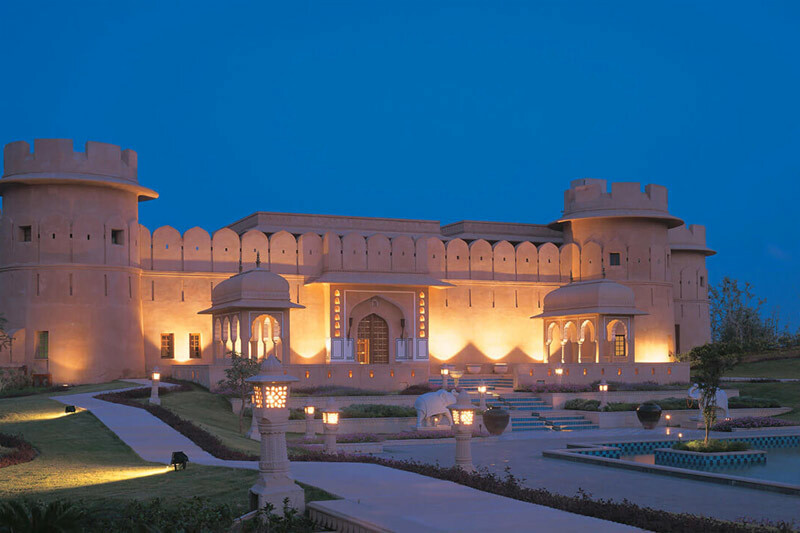 Excursion to Amber Fort and city tour of Jaipur. Transfer to airport for flight to Udaipur at 02.40 p.m. on IT 4306. Arrive Udiapur at 05.10 a.m. and transfer to hotel. Overnight at your hotel in Udiapur. Cooking demonstration with lunch at Devra. 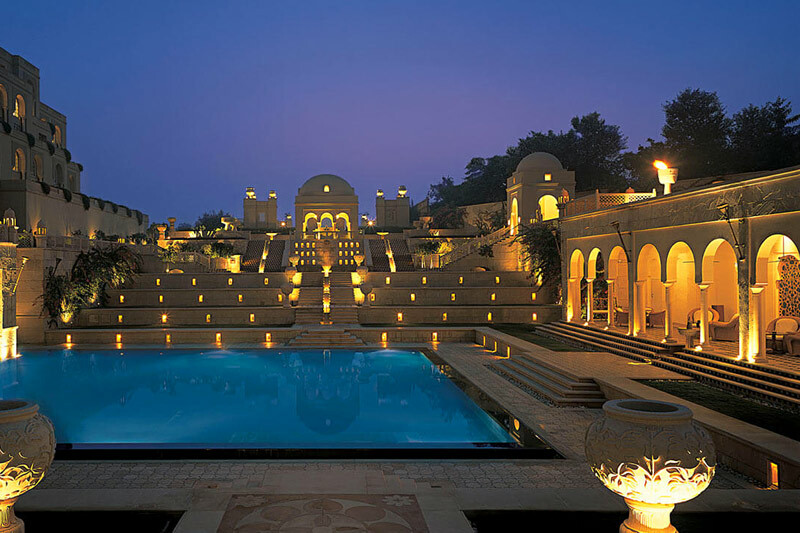 Overnight at your hotel in Udaipur. Morning at leisure to enjoy the spa facilities. Departure transfer to airport for flight to Mumbai at 03.50 p.m. on IC 471. Arrive Mumbai at 05.05 p.m.and transfer to hotel in Mumbai. Morning excursion to Elephant Caves. Afternoon city tour of Mumbai. 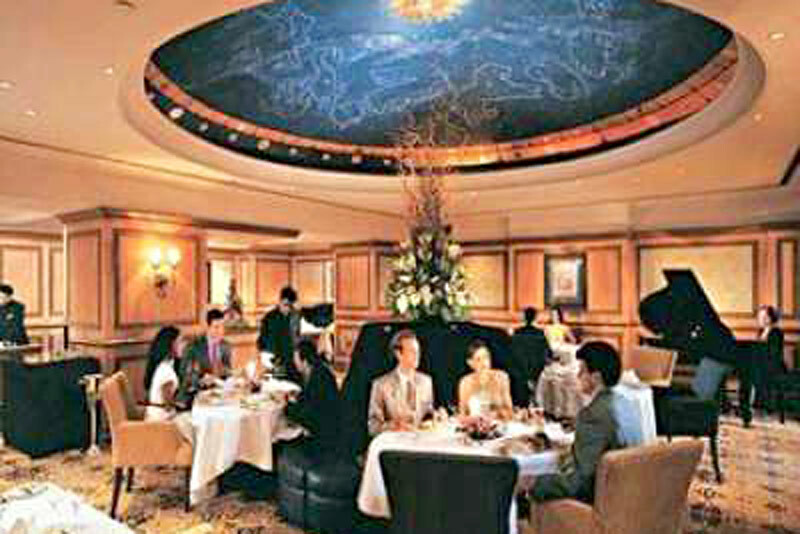 Dinner at Zodiac Grill at hotel Taj Mahal Palace and Towers. Transfer to international airport for departure flight. 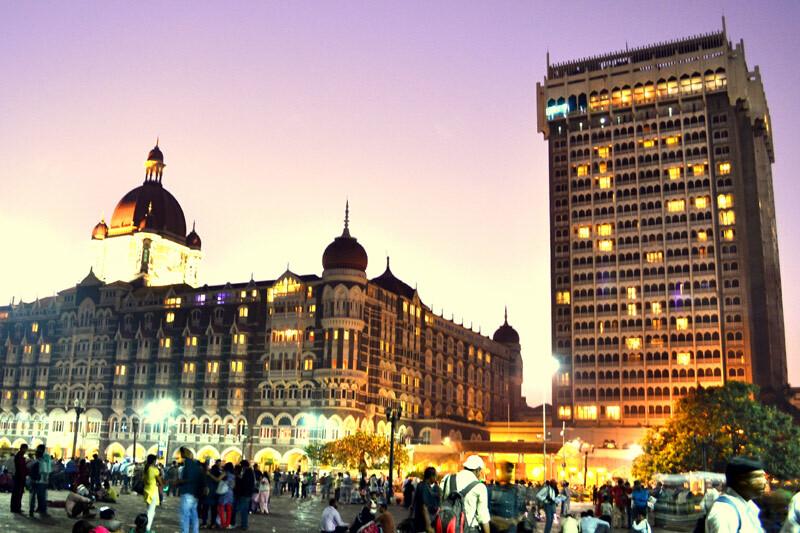 Total of eleven (11) hotel nights in India. Meals as mentioned in the itinerary: Daily Breakfast, 06 Lunches and 05 Dinners). Service of deluxe air-conditioned vehicle for the sightseeing / excursion as per program. Services of English-speaking local guide for the sightseeing/excursion. Train fare in 2 AC class for Lucknow / Agra sector. One time entrance fee at the monuments. Currently applicable taxes including Service tax. Any beverages including mineral water, soft drinks, alcoholic drinks, etc. unless otherwise specified. Any items of a personal nature such as tips, laundry, telephone calls, etc. Undue escalation in fuel prices, new taxes levies on hotels and transportation services or any hikes in entrance fees. Any large tax hikes and new levies shall be payable extra. Supplements for Christmas and New Year’s Eve. 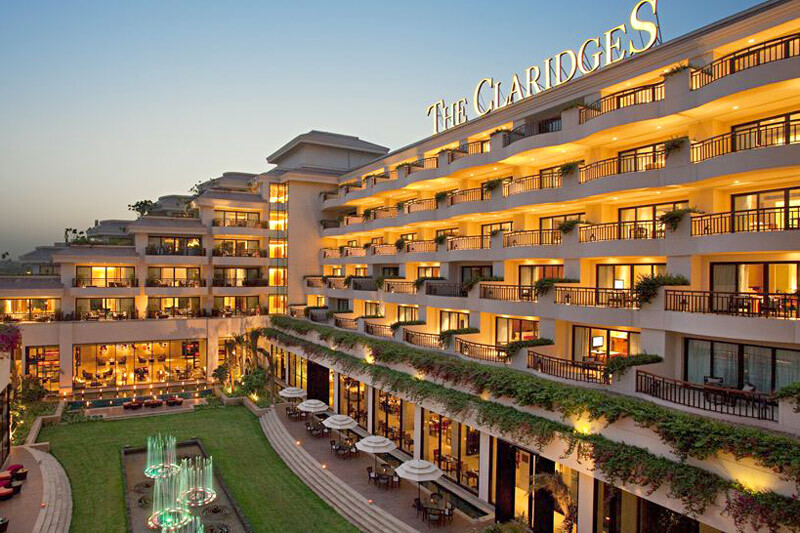 The Claridges, New Delhi is the flagship hotel of The Claridges Hotels & Resorts, set amid the verdant center of the city in close proximity of the business district, shopping and cultural centers and historical landmarks. 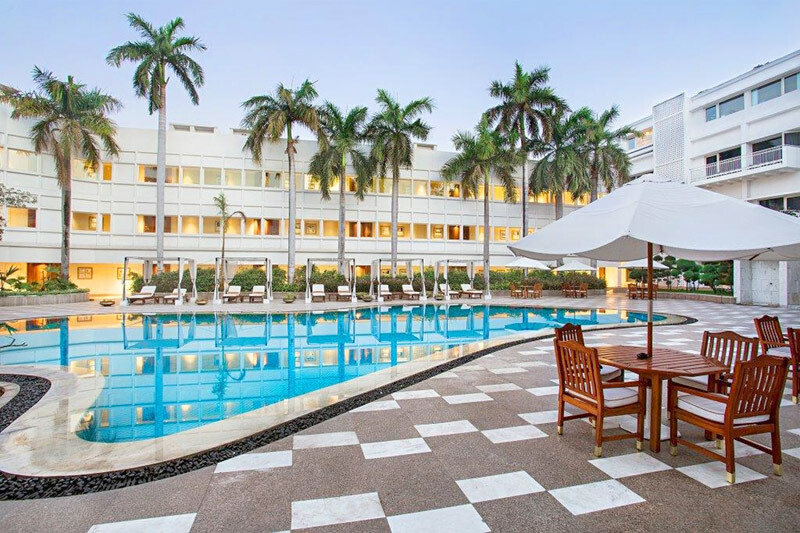 Distinguished guest rooms and suites with their classic, understated decor, the lush landscaped garden with swaying palm trees, and personalized service create a tranquil haven for the business or leisure travelers in the heart of the busy city. 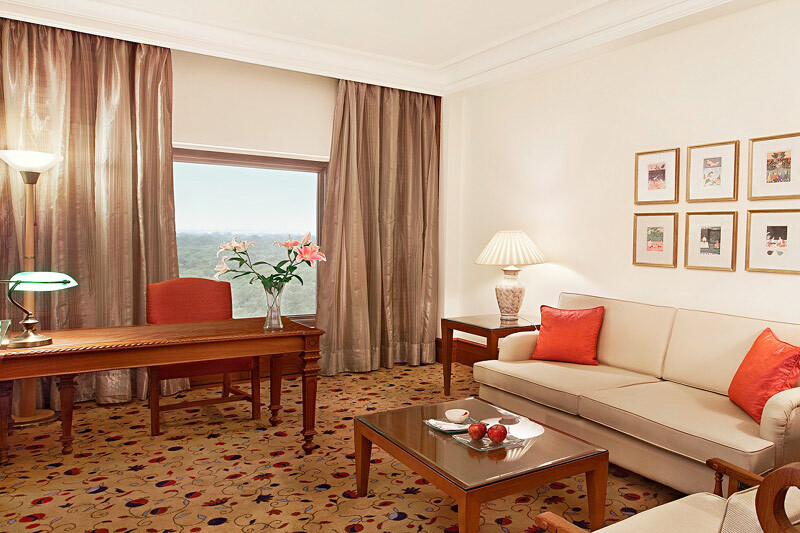 The Claridges, New Delhi offers choice accommodation ranging from beautifully-appointed spacious Deluxe Rooms to Luxury Suites, some with their own private terrace. 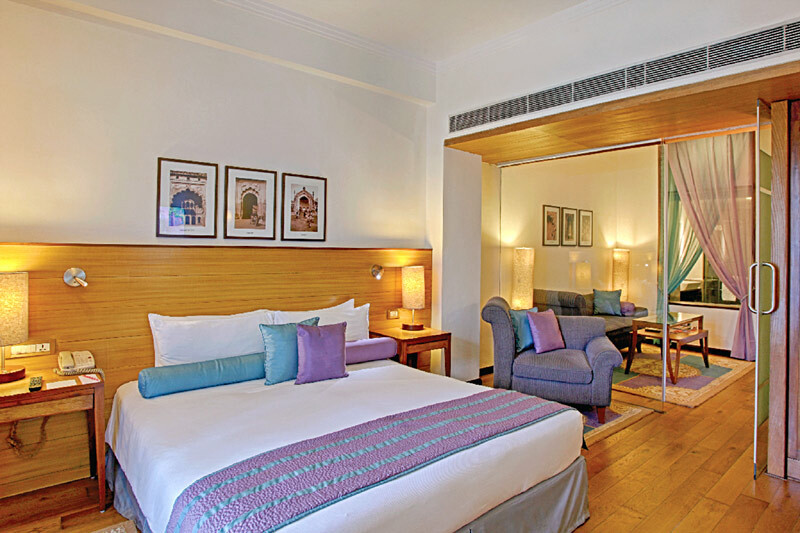 Its 137 rooms and suites are amongst the most spacious in Delhi,with a blend of the classic and contemporary, offering the comfort of a home in a luxurious hotel setting, along with modern conveniences and facilities. 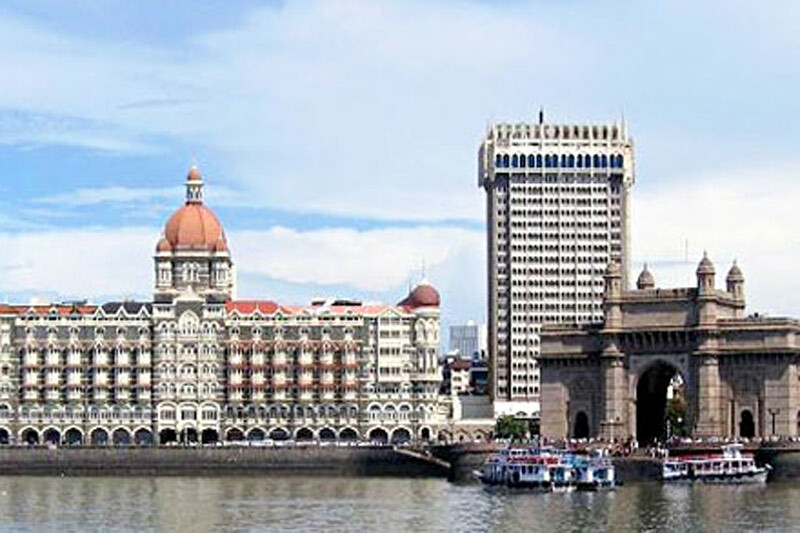 The Taj Mahal Palace is Mumbai’s first harbor landmark (built 21 years before the Gateway of India) and the site of the first licensed bar in the city. A treasure-trove of invaluable memorabilia, there is a story to tell behind every pillar, a landmark deal in every boardroom, and a storied celebration under every awning. 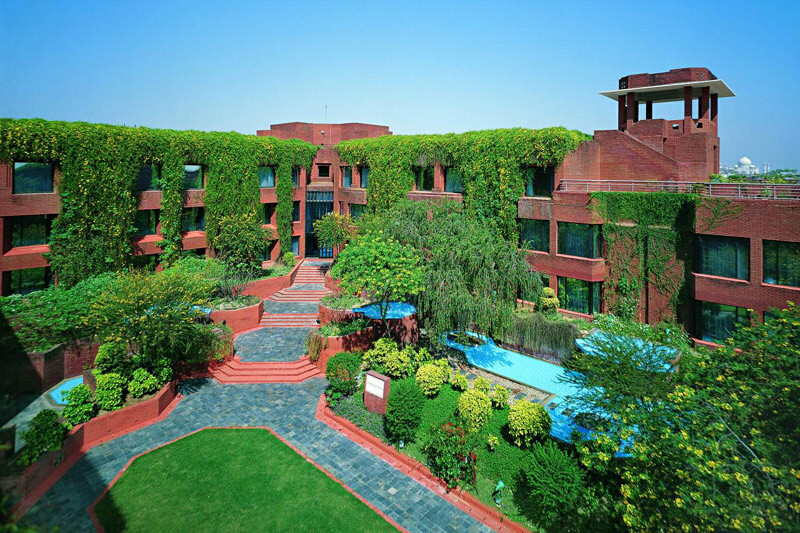 The regal Jaypee Palace Hotel is a glorious structural blend of red sandstone and marble and is spread over an unbounded 25 acres of elegantly landscaped luxuriant greenery. 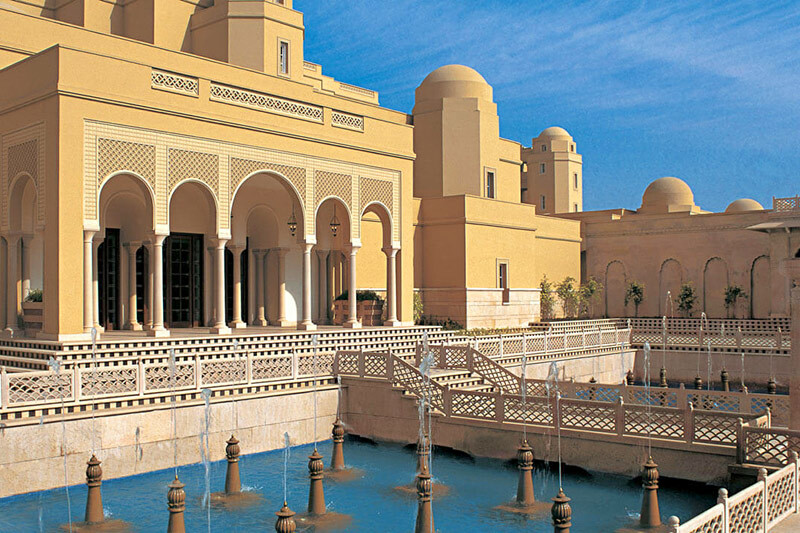 Sprinkled with enormous water bodies and endless walkways, this magical creation impeccably blends Mughal and contemporary architecture with modern amenities. 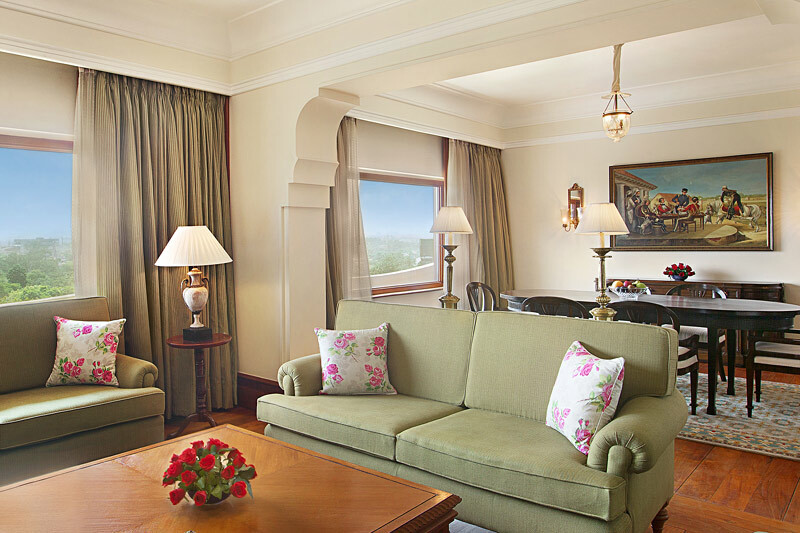 Leading the way to luxurious rooms and suites, the impressive interiors along the way set the tone for a majestic way. 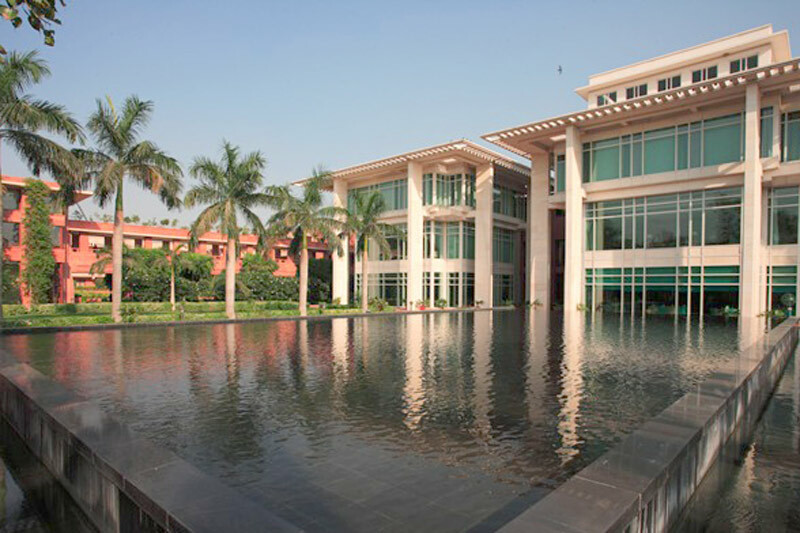 Just under 5 miles from the railway terminus and a mere 12 miles from the airport, on the banks of the river Gomti and right in the heart of Lucknow’s business and entertainment areas lies the Vivanta by Taj – Gomti Nagar. 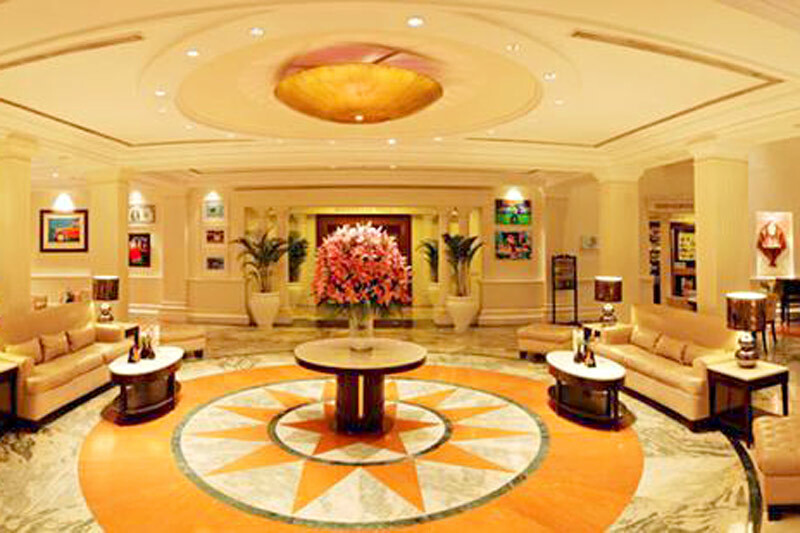 The lobby is a unique mix of chic and classic, where graceful pillars make a stylish presence with a dramatic dome and a mariner’s brass compass. This arrival zone sets the tone for guestrooms and banquet facilities that deliver the ultimate in urban relaxation. 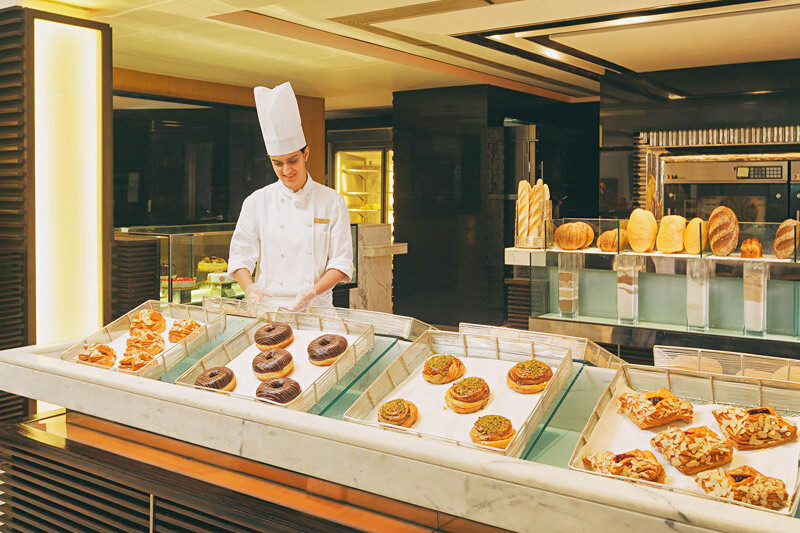 Discover the most happening restaurants which open to the lobby to create an enticing food zone offering the best in world cuisine. 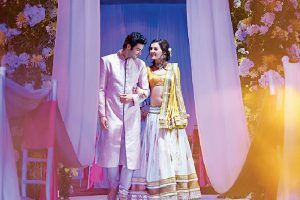 Vivanta by Taj – Gomti Nagar, Lucknow has all the entertainment and connectivity options today’s traveler requires. Modern architecture marks cosmopolitan rooms. 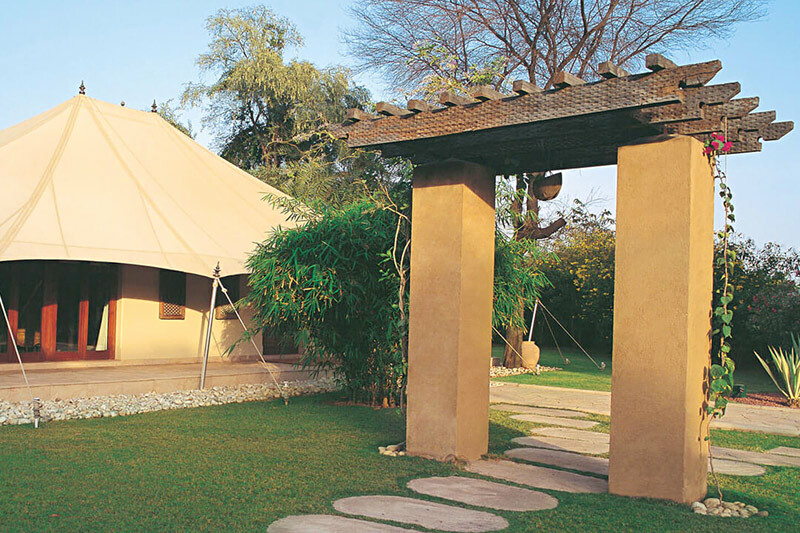 Relax in leisure or stroll across 25 acres of garden space, soak in the colonial look and experience the buzz. 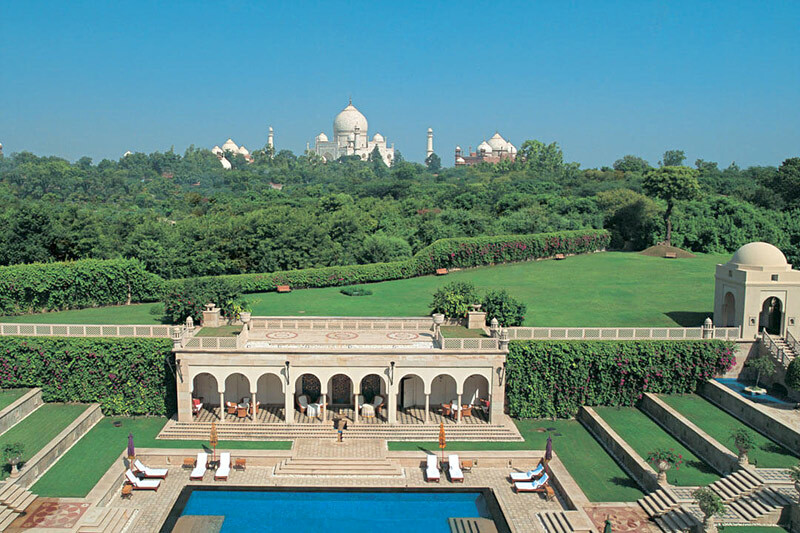 Opened in 2001, this five star luxury hotel is located less than half a mile from the Taj Mahal. 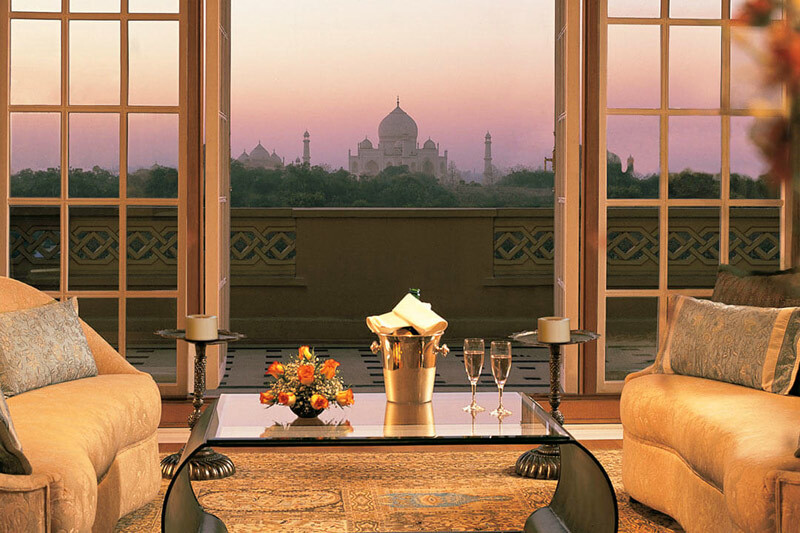 All rooms, suites, lobby, bar and lounge offer breathtaking views of this astounding monument. All 105 rooms and 7 suites come equipped with an LCD TV, DVD player, satellite television, wired & wireless broadband internet access, separate walk-in closet with electronic safe, dual line telephones with voice mail, personal mini-bar, 24-hour personalized butler service, and a well appointed bathroom with a basket of Ayurvedic toiletries. Two restaurants offer a choice of fine international cuisine and authentic flavors of India. Recreational facilities include a gymnasium, heated swimming pool, music and digital video discs along with a wide range of Spa services that befits the self-indulgence of royalty. 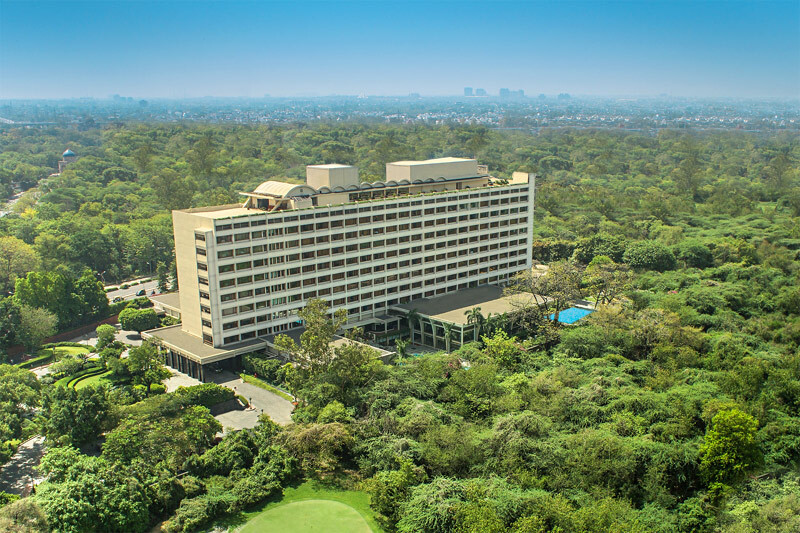 The Oberoi Rajvilas, is a royal resort set in a breathtaking thirty two acre oasis of beautiful landscaped gardens and exotic bird-life. 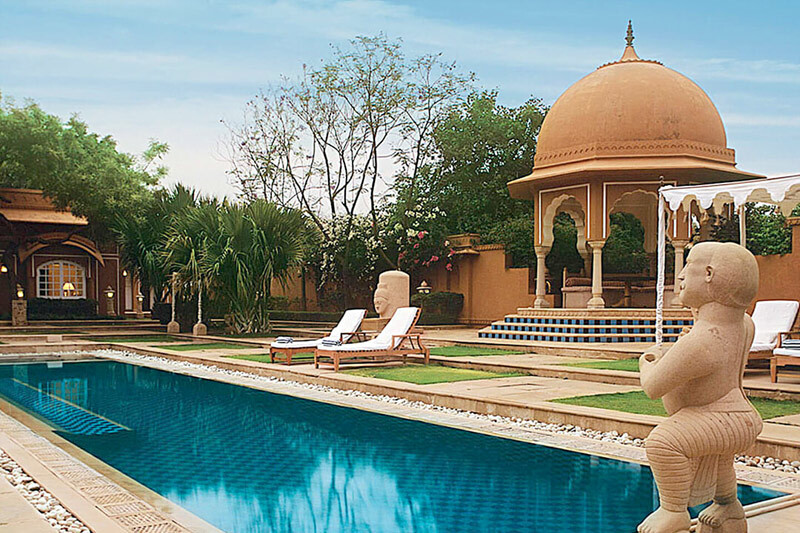 Built around an 18th century Shiva temple which affords chanting with a Hindu priest, meditation and morning yoga, the Oberoi Rajvilas is a haven of mystical peace and natural serenity. 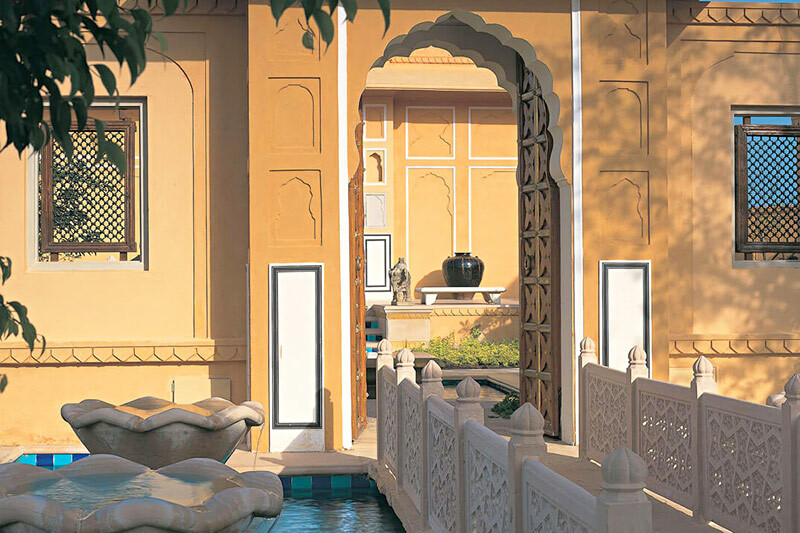 Traditional techniques have been used to replicate the famous pink lime plaster walls of Jaipur, throughout the resort. 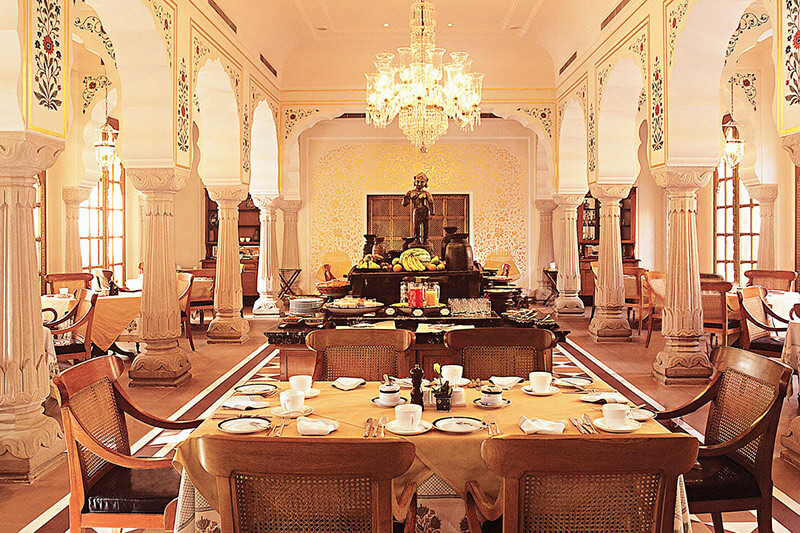 Also adorned with Mughal arches, gold leaf frescoes, high domed ceilings and magnificent crystal chandeliers, the Oberoi Rajvilas epitomizes traditional Rajasthani charm and Oberoi luxury. The rooms are laid out in small clusters that afford privacy for couples, and convenience for families or small groups wishing to stay near one another. Each cluster unfolds onto a courtyard crowned with a traditional fountain and framed by natural canopies abundant with native flowers. 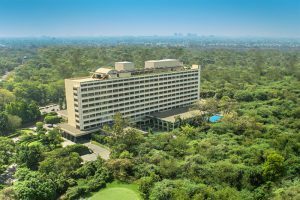 Centrally located in New Delhi, 30 minutes from the international airport, the five star Oberoi reflects the city’s spirit in a harmonious blend of tradition and contemporary sophistication and overlooks Delhi’s prestigious Golf Club on one side and the heritage site of Humayun’s Tomb on the other. Dining is in an inviting minimalist outlet, a lavishly decorated Continental restaurant with a Mediterranean twist, a rooftop Chinese venue with dim sum, and a pastry shop. 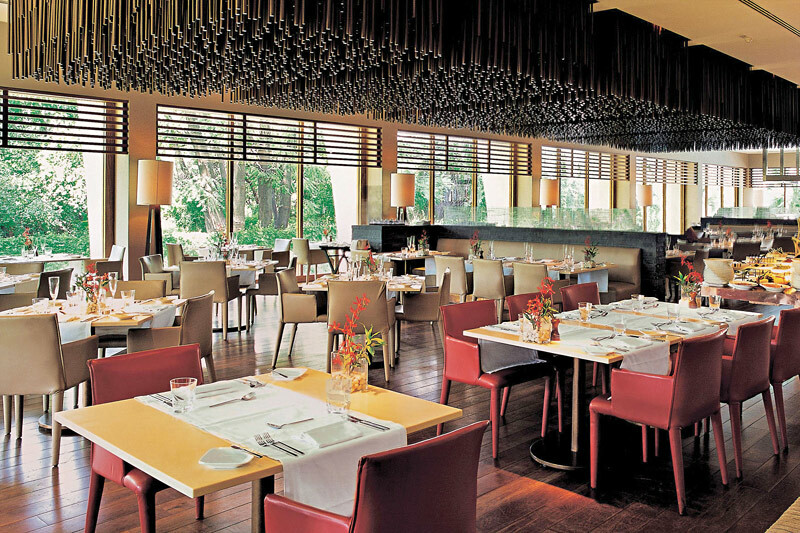 Guests enjoy food prepared in the stone oven, freshly-prepared sushi, and a substantial wine list. The open-view tandoori grill allows diners to become part of the culinary experience as they witness their meals being prepared. The health club invites guests to relax in its swimming pool, steam room, sauna, whirlpool, massage facilities and beauty salon. In fact, the Turkish marble and oak wood spa spans over 9,000 square feet of luxury with a staff trained by the elite Banyan Tree Spa in Thailand. A second heated pool makes winter dips a pleasure. The gym is well-equipped and golfers are a five-minute walk from the first tee of one the country’s premier courses. 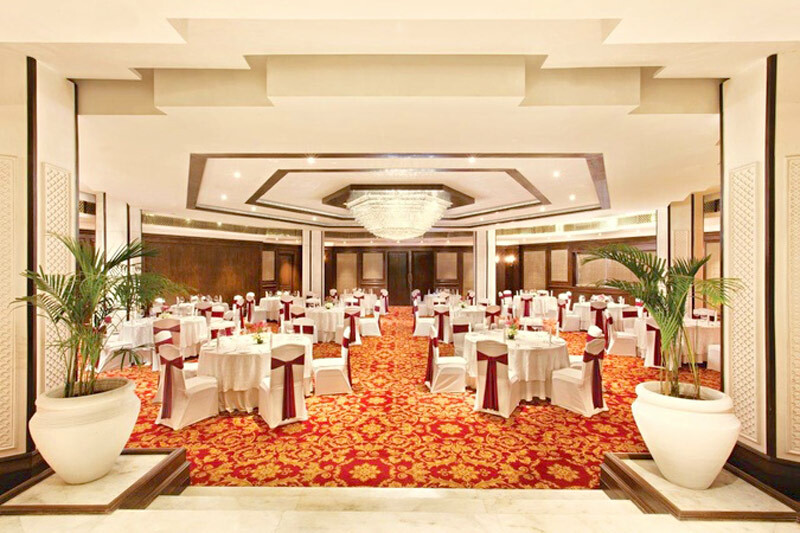 Set on the banks of the scenic Fateh Sagar Lake, the Radisson Blu Udaipur Palace Resort & Spa provides a central location in this historic city, often referred to as the Venice of the East. 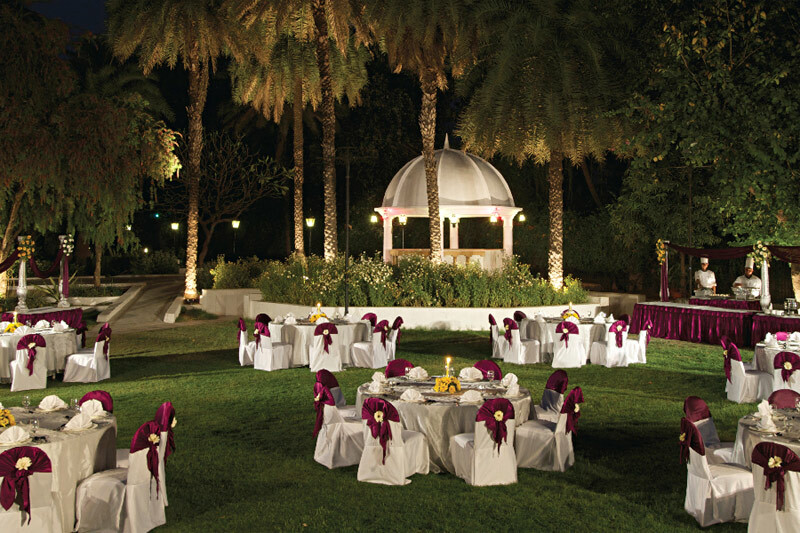 Surrounded by breathtaking palaces and ancient sites, this hotel in Udaipur offers upper upscale amenities like an on-site spa and a two-level swimming pool with a cascading waterfall. Guests can enjoy Pan-Asian cuisine and Indian specialties at the restaurants, or they can relax on the pool deck with a refreshing cocktail from the H20 bar. 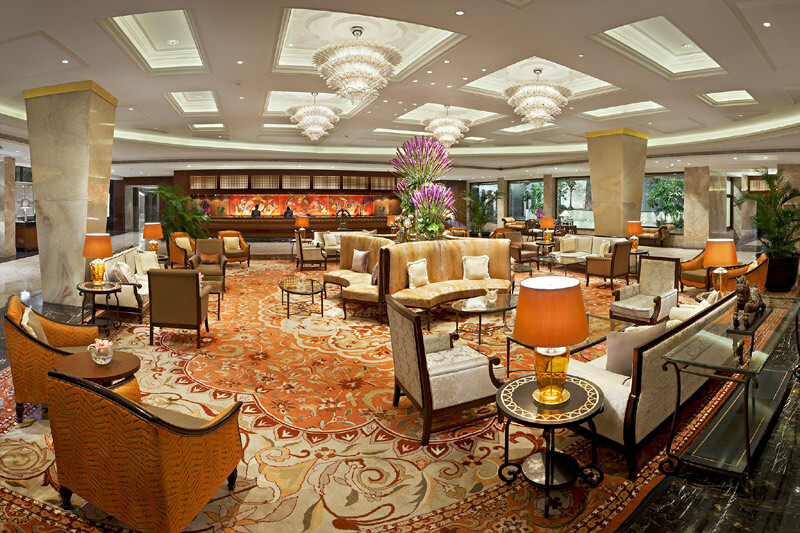 With spacious even facilities, valet parking and ample space for cars and large coaches, they are also the perfect spot for social or professional gatherings. 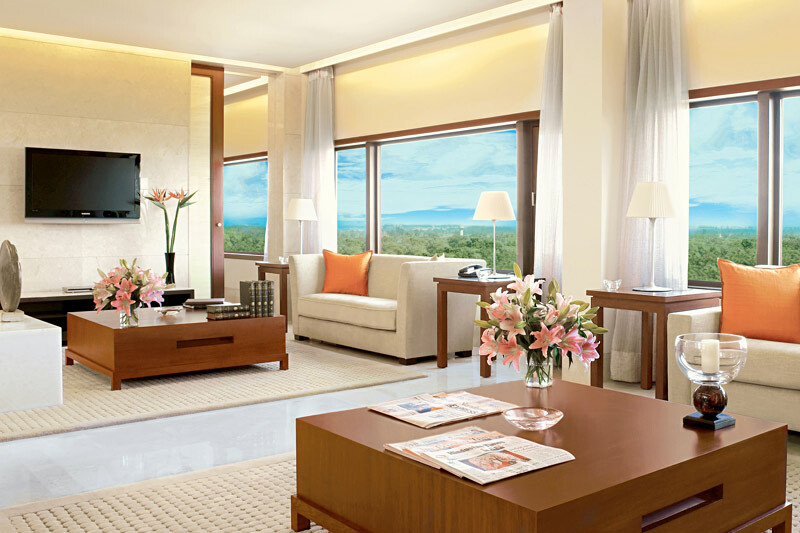 When you need a tranquil place to rest after a day of meetings or sight-seeing, the Radisson Blu Udaipur has 240 plush rooms and suites that overlook the lush jungle and lawns of the dazzling lake. While the view at the resort in Udaipur calms your sense, unwind with amenities like soft bathrobes, slippers and turn down amenities. visitors traveling for work appreciate the Business Class Rooms, and the Heritage Suite is perfect for romantic getaways. In the heart of Rajasthan, Udaipur is a city of majestic palaces and beautiful lakes. Here, adorning the banks of Lake Pichola the five star Oberoi Udaivilas captures all the romance and splendour of a royal era. 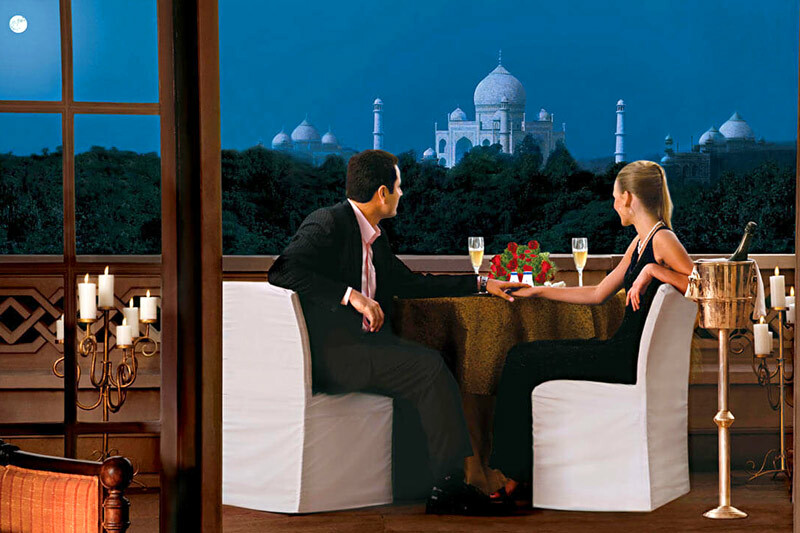 Fine international cuisine, authentic flavors of Rajasthan or a quiet drink are all presented with views of the City Palace and Lake Pichola. 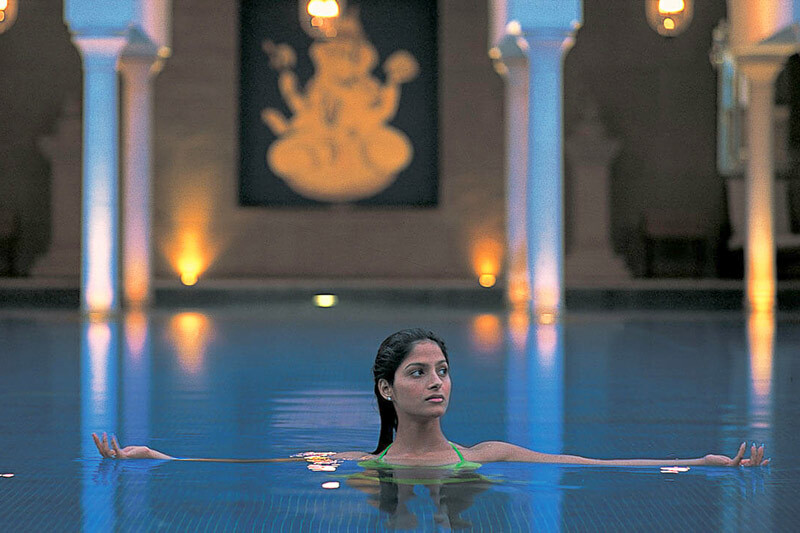 The luxurious spa with its own swimming pool overlooks the lake and is a haven of serenity. 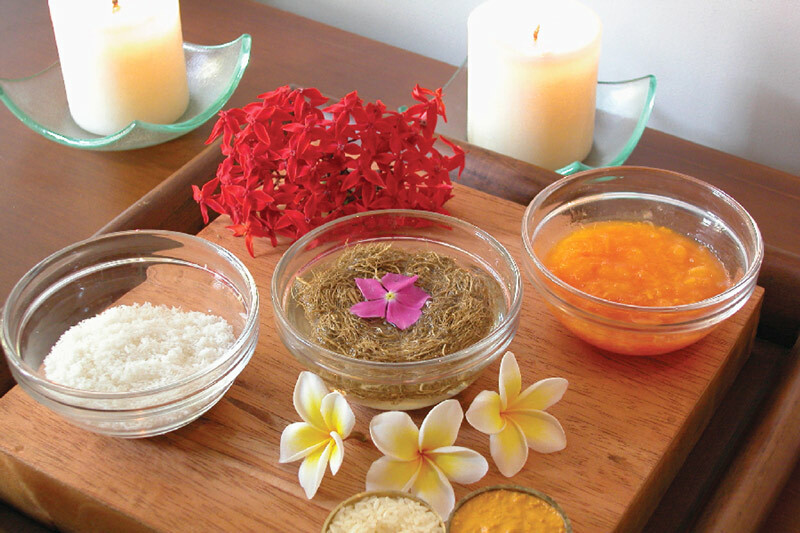 Trained therapists pamper body and soul with rejuvenating treatments. 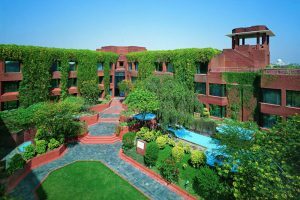 The resort also offers the opportunity to undertake private Yoga, meditations and Pranayam sessions with the resident Yoga teacher or explore the city steeped in the romance of the oldest living dynasty in the world.